Learn about the life and art of collage artist Megan Coyle. Learn how to study a work of art. Write a story about a collage by using specific details from the art. Tell students they will study one of Megan Coyle’s collages in great detail and do related writing and art activities. Explain that many works of art have a story and that different details in a painting or collage help tell that story. The students will study a collage, write a story about it, and make their own paper collage. Review what a collage is. 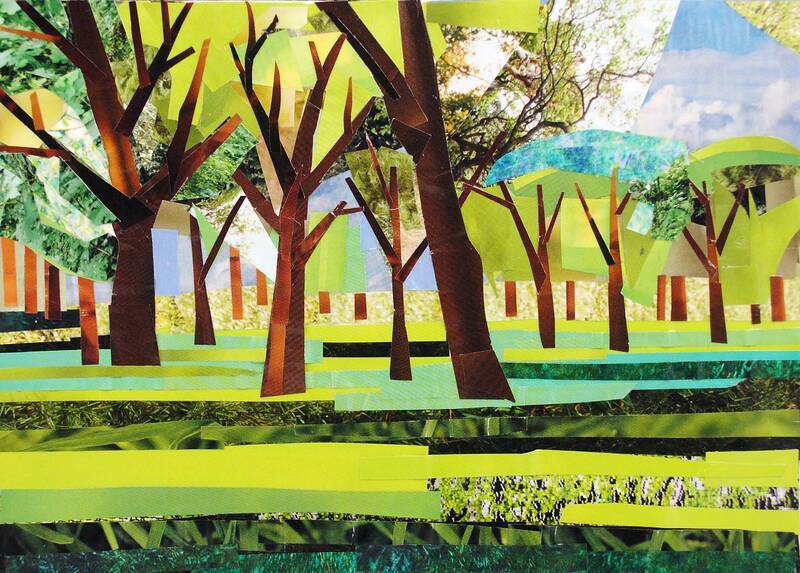 Discuss the different types of materials that can be used to make a collage. Talk about the way Megan Coyle’s collages are made. Have students look at “Coney Island.” Review the collage in class, and touch upon the following questions: What do you see? Who do you think these people are? Who do they remind you of? Where are they? What are they doing? How are they feeling? Are they inside or outside? Are they warm or cold? Where are they going? Ask students to support their answers with details from the collage. Read the brief biography of Megan Coyle. Tell pre-readers about Megan and relate her life to the collage. Print out the story template and have students write a short story or dictate their story to you. Review the Make a Collage Story instructions. Pass out materials for making collages and have students make their own paper collage. Have students begin the online lesson activities: What is Collage?, Megan Coyle Collage Technique, Coney Island Questions, Background on Coney Island, and read the artist biography. Have the class review and discuss the following: Is the collage cheerful or sad? What is going on in the collage? Do you remember a time when you were doing what the people in the collage are doing? Have the students support their answers with details from the artwork. Print out the story template, review the instructions with the class, and have the students write their own stories. Print out the Make a Collage Story instructions and review them with the class. Pass out materials to make collages in class. Have the students construct their own paper collages that tell a story. Have students guess one another’s story. During class discussion, did students support their responses with details from the collage? For the story, did the student use his or her imagination? Did the student mention specific details from the collage? Did the student complete a paper collage? Did the paper collage reflect a story?